We are a young company specializing in repair phones, computer support and web marketing . The logo that we currently have has gotten tired and does not seem very professional . We want a new flat logo redesigned keeping the same colors and the same structure , possibly with the rim of the Italian flag . The logo will also be printed on T-shirts so we need excellent quality . 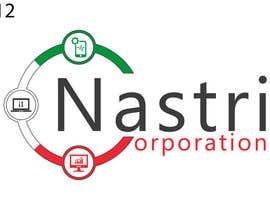 The company name is NASTRI CORPORATION and you can find our actual logo in our avatar photo.